A student designed a sensor that detects if the cycle is being moved and it emits an alarm sound. He also design a mobile app to pair with the sensor. The app tracks the cycle. 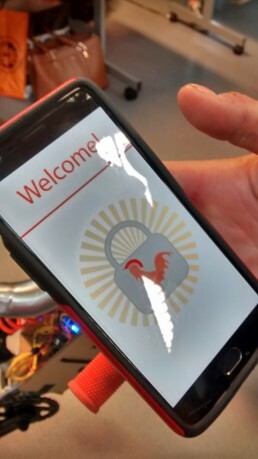 It also provides the option to mark if a location is a hotspot for cycle theft. He designed the interface to account for both left and right hand users. I teach a module in Interaction Design on the Product Design Programme at the University of Sussex, Brighton, UK. This term, I introduced the Arduino platform to the Product Design Programme. Arduino is an open-source physical computing platform that is designed for make physical computing accessible to anyone who is interested. It has been around for roughly 10 years and supported by an active development community. I have been working with Arduino since its release in 2007. Learn more about Arduino here. A student designed a laser triggered metronome to support his drumming practice. This module introduced the students to hands-on coding and physical computing which entails circuit design and coding. Their goal was to develop a interactive project of their choosing that demonstrated their understanding of theory of interactive principles and their application of new technical skills. Seek out experts with key knowledge: Tutors, each other and Arduino forums. A student created an Imperial Walker coin bank. It detects the weight of the coin to determine what it is and keeps track of how much you have in the bank. They presented their final projects through a self-curated exhibition open to the entire school. It was well attended and they gather valuable feedback on the functionality and usability of their projects that they applied to future iterations. A student designed a module sensor to attach to free-weights to track rep workouts. In my role as a facilitator of learning, I always aim to develop engaging and accessible methods for conveying ideas and concepts. At the University of Sussex, we have a lovely community for sharing experienced and techniques across the university. Through the Technology Enhanced Learning (TEL) group, I have been able to share my methods through a variety of their venues. As part of Sussex's Innovation Week, I ran a Electric Paper Workshop with staff to demonstrate how to create digital interactive systems with paper, ink and graphite. Hands-On Learning with Technology: Technology Enhanced Learning Podcast where I discuss using game design and DIY technology to create interactive opportunities for learning and engagement. 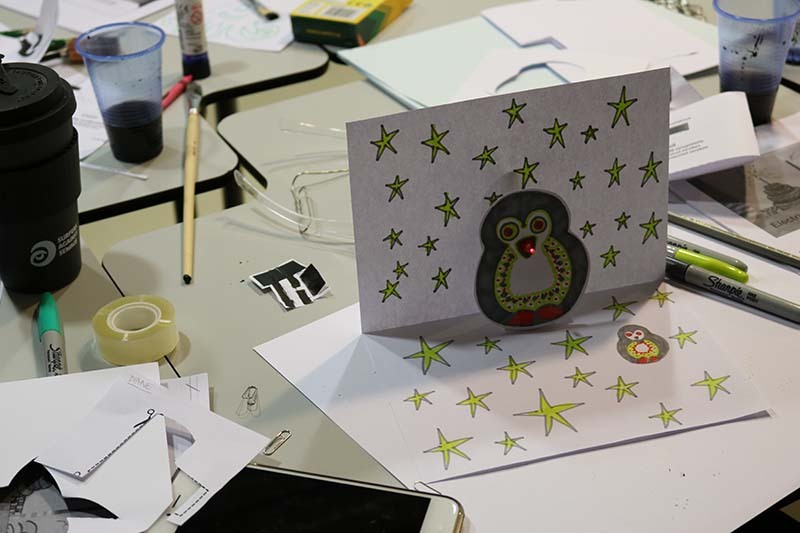 #DIWSussex Makerspaces: Here is an interview of the process and opportunities for using graphite, conductive ink and paper to create an interactive experience. 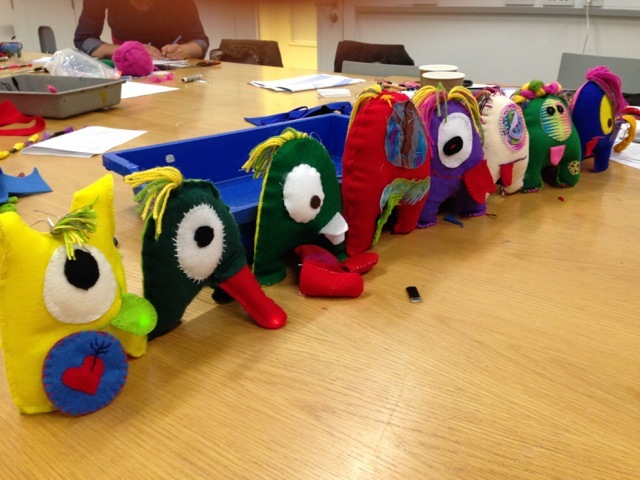 We had a lovely time running a workshop at the V&A Museum that introduces soft circuits. The participants get to create their own Tousle Monster. Tousle has one eye and a tuff of hair. 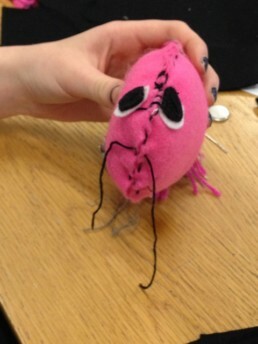 The hair is made up of two sections of conductive thread separated by regular yarn. When the two sections of conductive thread are "tousled" together, they complete the circuit. When the circuit is complete an LED light in the tongue lights ups. The grey threads are conductive thread in two sections on either side of regular yarn. This is the "switch"to turn on the LED in the tongue. The participants had a good time learning how to create the Tousle and conductive materials. 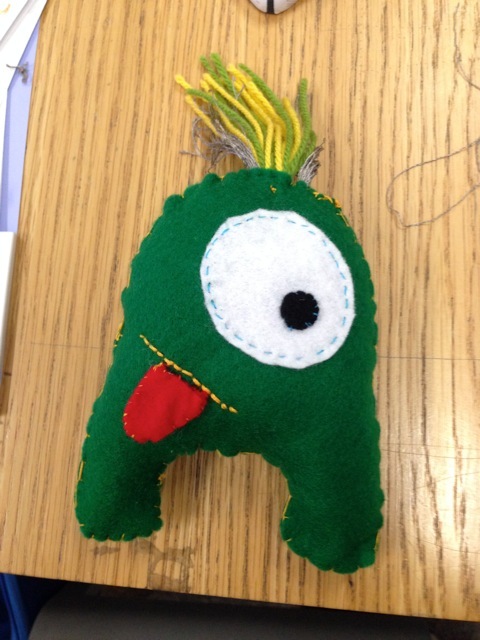 Some of the participants created their own version in the form of a fish. Everyone went home with a working Tousle monster to show their friends. They have a new awareness of the abilities conductive materials can offer the crafting community. Fish version of Tousle. The tail acts as the switch.